It’s a scene most of us will be familiar with: in the mad morning rush, the car key is nowhere to be found. And anyone who has ever had both hands full with shopping bags will have wished that an “open sesame” was all it took to open their car door. 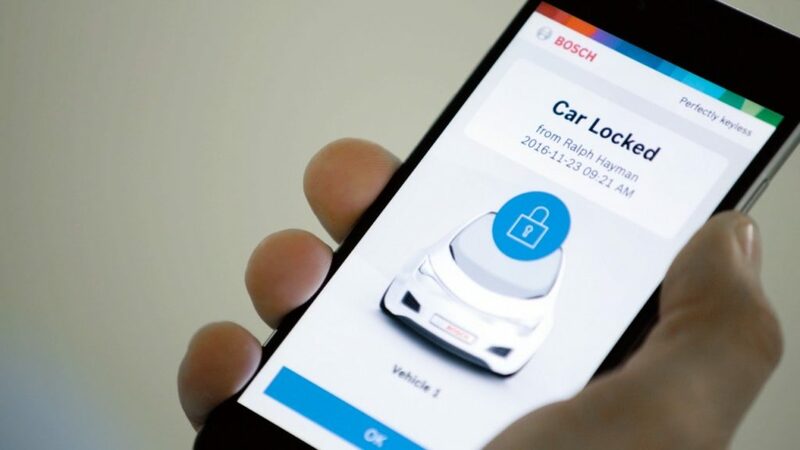 By turning the smartphone into a car key, Bosch will be putting an end to this irksome hunt for the key. “Perfectly Keyless, our digital vehicle access system, means that drivers will be able to do without traditional car keys. 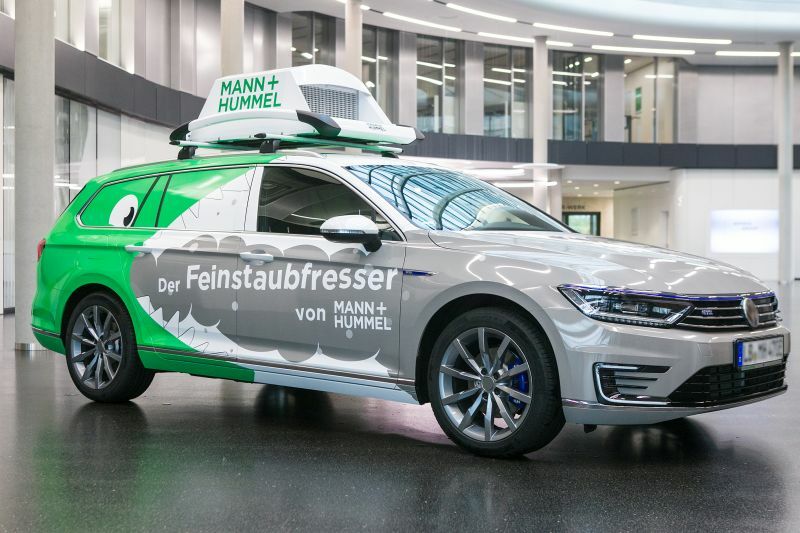 It’s a great example of stress-free connected mobility,” says Harald Kröger, president of the Bosch Automotive Electronics division. As drivers approach their vehicles, their smartphones are identified by the on-board sensors. “Once this identification has happened, the vehicle is unlocked without any need for a physical key. Similarly, no key is needed to start the engine or to lock the car again at the end of a journey,” Kröger says. Vehicle owners can also use an app to give other drivers permission to use their vehicles. In a secure process that is protected against unauthorized access, an additional virtual key will then be sent via the cloud to other smartphones. This will allow the providers of car-sharing services and the operators of vehicle fleets to manage access and keys flexibly. Perfectly Keyless is a digital car key. To use it, drivers download an app onto their smartphones, and connect their cars to the app. Once they have done this, the smartphone generates a one-off security key that fits their respective vehicle’s digital lock. Perfectly Keyless uses a wireless connection to the on-board sensors to measure how far away the smartphone is, and to identify the security key. Once the distance between driver and vehicle is less than two meters, the car door is unlocked. Hunting for the car key is no longer necessary. As soon as the vehicle has been unlocked, any predetermined individual settings, such as those for the rear-view mirror and seat position, are activated. And if Perfectly Keyless detects that the smartphone is in the vehicle, a touch of the start-stop button is enough to start the engine. When the driver gets out of the car at the end of the journey, the system continues to keep a virtual eye on the smartphone. Once driver and phone have moved more than two meters away from the car, it is automatically locked securely. The system sends an acknowledgment to the driver’s smartphone. Bosch is working to create technological solutions for a new era in mobility: free of accidents, stress, and emissions. 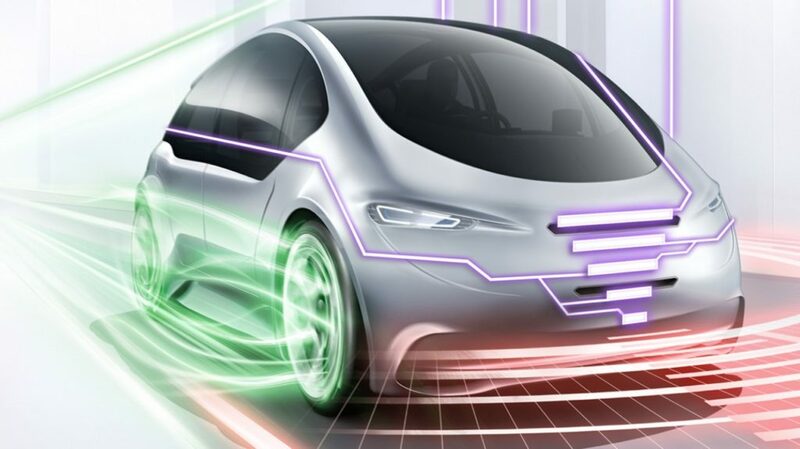 The supplier of technology and services will be presenting its innovations for the mobility of tomorrow at the 67th International Motor Show (IAA) in Frankfurt. You can find Bosch at booth A03 in hall 8. Automated valet parking: Driverless parking saves time and reduces stress. At the Mercedes-Benz Museum parking garage in Stuttgart, Bosch has joined forces with Daimler to make automated valet parking a reality. Using a smartphone function, drivers can now automatically park their cars in their assigned spots without having to keep an eye on the maneuver. This driverless parking is made possible by the interplay between in-vehicle technology and intelligent parking-garage infrastructure supplied by Bosch. Automated valet parking is an important milestone on the road to autonomous driving. Over-the-air software updates: Updating software and apps online is second nature to smartphone users. Now, Bosch is doing the same for cars – with over-the-air updates. Vehicle software can be kept up to date and new features added to the car – overnight, encrypted, and protected from unauthorized access. This allows drivers to try out and then activate features such as automated valet parking, community-based parking, and lane-keeping assistants. Electric axle (e-axle): The e-axle is a compact, cost-optimized solution for electrical powertrains in battery-electric vehicles and hybrids. In this innovation, the electric motor, power electronics, and transmission are integrated in a compact unit which directly drives the vehicle’s axle. This reduces the complexity of the electrical powertrain and, thanks to the system designed by Bosch, could potentially shorten the time taken to develop electric vehicles. There are various e-axle configurations. Its power output can be scaled between 50 and 300 kilowatts, which means the e-axle can be installed in compact cars, SUVs, and even light commercial vehicles. Its high level of efficiency is the result of two factors. First, the continuous improvement of electric motor and power electronics and, second, the reduction of the number of interfaces and components such as high-voltage cables, plugs, and cooling units. In short, the Bosch e-axle means greater range with the same battery capacity. Bosch has developed a flexible approach to e-axle manufacturing that can be implemented worldwide, thus ensuring a reliable supply everywhere. Automated driving: Automated driving makes roads safer. Increasing automation can lower accident rates even further – by up to one-third in Germany alone. Making automated driving reality calls for profound understanding of all vehicle systems. Bosch has this expertise, and manufactures most of the key components itself – including radar, video, and ultrasonic sensors, braking control systems, electrical power-steering units, display instruments, and connectivity solutions inside and outside the vehicle. From the start of the next decade, there is a possibility that highly automated freeway driving (SAE level 3) will be permitted for cars featuring Bosch technology. In addition, Bosch is working with Daimler to make fully automated driving (SAE level 4) and driverless mobility (SAE level 5) possible in towns and cities. Their objectives include the development and start of production of an autonomous driving system for robocabs starting in the early 2020s. Braking system: Bosch has developed the second generation of its vacuum-independent, electromechanical brake booster. Like the first-generation unit, the iBooster2 meets all the requirements of a cutting-edge braking system. This second-generation brake booster has been designed to be even more compact, and also generates brake pressure even faster. 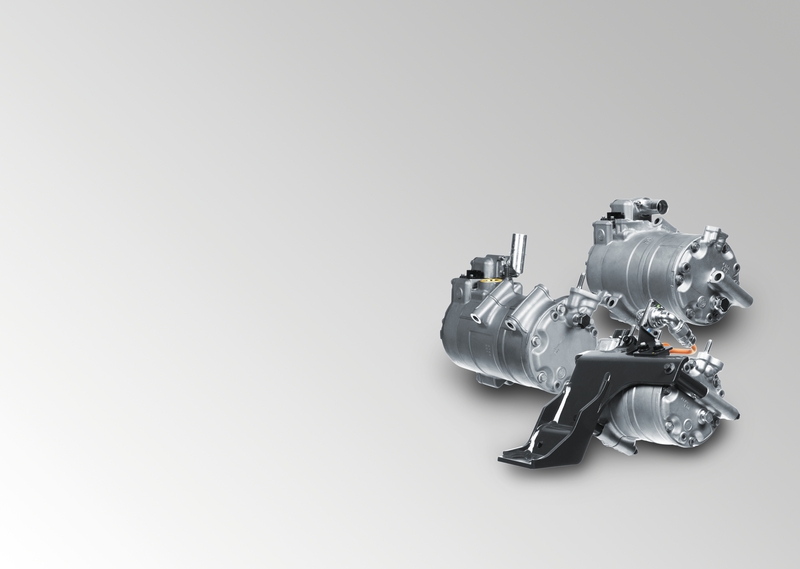 The iBooster is suitable for all powertrains – in particular in hybrid and electric vehicles. In combination with the ESP electronic stability program, the electromechanical brake booster supplies the braking-system redundancy needed for automated driving. If one of the two components fails, the other can safely decelerate and stop the self-driving car – without the driver having to intervene. Electric steering: One key technology for automated driving is fail-operational, electric power steering. In the rare event of a malfunction, the Bosch system is capable of retaining 50 percent of the electric steering functionality in conventional and autonomous vehicles. Thanks to this technology, automakers can meet fail-operational requirements – some of which have been stipulated in the United States by the National Highway Traffic Safety Administration (NHTSA) and the U.S. Department of Transportation in its Federal Automated Vehicles Policy. Friction-coefficient map: Surface grip, or friction coefficient, depends on whether the road surface is dry, wet, or icy. Drivers have to modify their driving style to avoid critical situations. Bosch is developing a cloud-based friction-coefficient map that will allow self-driving vehicles to determine how road surface will develop over the course of a journey. The friction-coefficient map uses the sensors of the ESP electronic stability program to collect information on road-surface characteristics. Aided by data from weather stations and road sensors in the infrastructure, the map calculates current friction coefficients and forecasts upcoming ones. This Bosch service then supplies connected vehicles with friction-coefficient maps via the cloud in real time – in turn enhancing the safety and robustness of automated driving functions. Finding a parking space: Bosch community-based parking simplifies the search for a suitable space. Using the ultrasonic sensors of their parking assist system, cars identify and measure the gaps between parked cars as they drive past them. This information is transferred in real time to a digital parking-space map, which drivers can use to find the nearest vacant spaces. 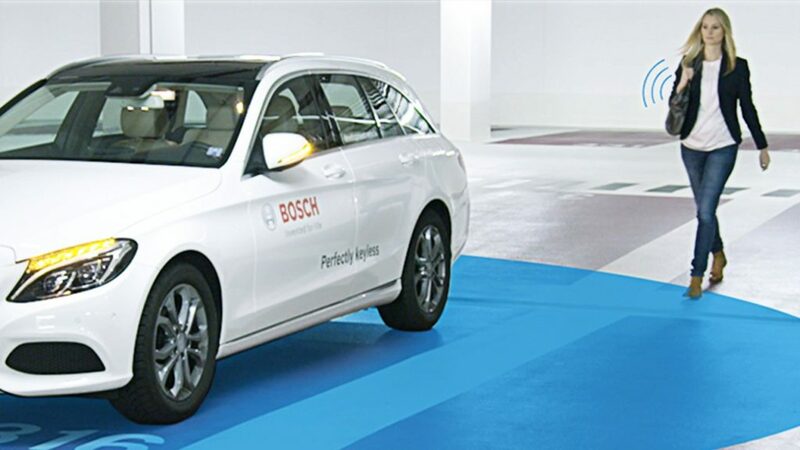 In cooperation with Mercedes-Benz and other automakers, Bosch is testing this service in cities in Germany and elsewhere in Europe. Bosch plans to supplement its community-based parking service with a function that will allow parking fees to be paid digitally. Gaming app: The Parkineers app is designed to make finding a parking space easier. It is simple for users of this gaming app to share information on parking restrictions, such as resident-only spaces or temporary bans on parking. App users are part of a community: they can make their avatars visible to all, make it clear which areas likely have vacant parking spaces, and digitalize the parking situation in their neighborhood. Parkineers is currently available for iOS and Android users in Germany. Home Zone park pilot: Stress-free parking in a private garage or an assigned underground parking space: the Home Zone park pilot takes on this recurring maneuver, including the approach (up to 100 meters) to the parking space. All drivers have to do is teach the vehicle the maneuver once in a dummy run, then save it. From then on, their car will park itself independently in the preset parking space, without drivers having to keep an eye on the maneuver. For orientation, the Home Zone park pilot relies on twelve ultrasonic sensors and a stereo video camera, which recognize the objects detected during the dummy run and consequently guide the car safely to its parking space. 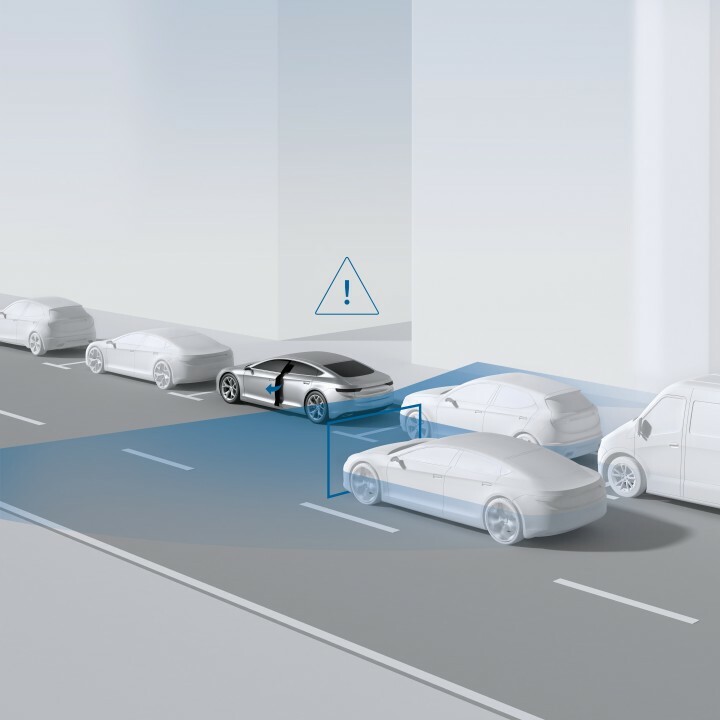 Occupant protection: Vehicle safety and occupant protection can be further improved by intelligently connecting surround and contact sensors with passive safety systems as well as braking and steering units. If the surround sensors detect a potential collision, the passive safety systems (such as airbags and seat-belt pretensioners) can be deployed more quickly. In addition, the restraining effect of these systems can be tailored precisely to the specific scenario. This helps to mitigate the consequences of an accident. Cyclist protection: Cyclists and pedestrians are the most vulnerable road users. In the interest of reducing accidents involving cyclists, the radar or video sensor in Bosch’s new automatic emergency-braking system can recognize cyclists – even if they suddenly cut in front of a car. If the system detects an imminent collision, it automatically triggers emergency braking. Ideally, this will mitigate the consequences of an accident – or even prevent it altogether. 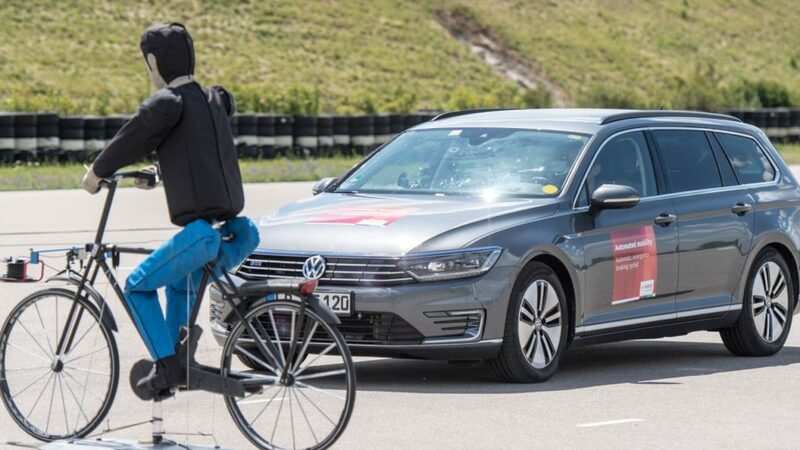 Starting in 2018, the rating criteria of the consumer-protection organization Euro NCAP will include automatic emergency braking that recognizes cyclists. Antilock braking system for pedelecs: Bosch is launching the first production-ready antilock braking system for e-bikes – and thus equipping bicycles with automotive technology. The e-bike ABS prevents the front wheel from locking up. This works on all surfaces, which means the e-cyclist can continue steering and stay in control while decelerating to a stop. A further feature prevents the rear wheel from lifting if the rider brakes too hard on a surface with good grip. Demonstration car for connected mobility services: Bosch’s show car features smart mobility services that will soon make driving less stressful and more convenient. They include community-based parking, preventive vehicle diagnostics, and Perfectly Keyless. The technology at the heart of it all is the Bosch Automotive Cloud Suite. It coordinates the seamless interplay of all mobility services in the cloud. Perfectly Keyless: Bosch’s Perfectly Keyless turns the smartphone into a car key. Thanks to this new vehicle-access system, drivers can open, start, and lock their vehicle without the bother of searching for keys. The Perfectly Keyless system automatically identifies the unique digital security key on a user’s smartphone. Only when it detects the user is less than two meters away will it unlock the door. Moreover, the vehicle will not start until the access system has located the smartphone inside the vehicle. Car owners can use the app to grant vehicle access to other app users. Predictive vehicle diagnostics: Nothing is more annoying than when a car breaks down on vacation. During regular drives, predictive diagnosis uses data and information from the cloud to analyze the condition of key components. If the data indicates that components are worn, the driver is notified before a defect occurs and receives a recommendation for the next visit to the repair shop. Predictive diagnostics prevents situations where the car unexpectedly breaks down. mySPIN smartphone integration: Using a smartphone’s navigation, streaming services, or a calendar even while driving a car or riding a motorcycle? mySPIN, the Bosch integration solution for smartphones, makes all this possible, hands-free. It simply integrates the smartphone and its apps into the vehicle’s infotainment system. It will soon be possible to integrate and display data from the cloud in real time. This data can warn drivers of hazards such as a sudden traffic jam. Driving app: The new Bosch smartphone driving app offers more convenience and entertainment for drivers whose vehicle is not equipped with a sophisticated infotainment system. The app brings together all the features of an infotainment system, including phone calls, text messaging, navigation, and other assistance innovations. Thanks to integrated voice control, drivers can use the app safely and conveniently. Retrofit eCall: Starting in 2018, the automatic eCall emergency call system will be standard equipment in all new motor vehicles. Bosch has developed the retrofit eCall solution for vehicles that do not have eCall as a standard feature. Powered by the vehicle’s cigarette lighter, this sensor device uses acceleration sensors and intelligent algorithms to detect whether a vehicle has been involved in an accident. In an emergency, a special smartphone app transmits data to a service center. This allows emergency services to respond even more quickly, thus increasing the chance of saving lives. Available in China, Germany, and the United States, this digital guardian angel has already helped a lot of drivers and passengers who found themselves in precarious situations. The connected show car: Bosch is using its show car to demonstrate how new user interfaces ensure better security, less stress, and fewer distractions when driving. This interface between people and vehicles provides drivers with relevant information as needed, and is an alert companion in every situation. In addition, the show car is always online, and connected to its surroundings as well as the owner’s smart home. This connectivity allows drivers to reserve the nearest e-bike or close the windows at home if it starts to rain – tapping or swiping the screen is all it takes. Anti-glare instrument cluster: Bosch is launching the world’s first optically bonded instrument cluster featuring full-HD resolution. Its screen reflects more than four times less light, allowing for better resolution from all angles – even in direct sunlight and in the dark. The secret lies in a new manufacturing processes that uses a thin layer of fluid to bond the screen with the glass. Thanks to the high-contrast screen, all information displayed is crystal-clear. This instrument cluster is popular among motorcyclists due to its robustness and enhanced resistance to dust and dirt. Head units with new technologies: Drivers can use a head unit to manage all information and entertainment in the vehicle. At the IAA 2017, Bosch is presenting head units that – thanks to new processors – are up to five times more powerful and boast up to seven times better graphic performance. Efficiency in the cockpit: The cockpits of today’s vehicles comprise a whole array of screens, displays, switches, and buttons. Each screen is typically operated by its own control unit. When space becomes scarce in a compact vehicle – or when new vehicle and operating concepts call for all information to be displayed on just one large central screen – it is essential to have maximum functionality and the fewest possible components. This is why Bosch has combined the functions of an instrument cluster with those of an infotainment system, with just one arithmetic logic unit (ALU) controlling all the information from behind the scenes. Owing to this convergence of different display systems, it is becoming easier to provide more functions in the tiniest of spaces. Complexity is also reduced, and there is more freedom to display information on different screens in the cockpit. 48-volt drive system for light electric vehicles: Especially for urban mobility, Bosch has developed an integrated 48-volt drive system including motor, control unit, battery, charger, display, and app. Bosch is thus making urban mobility efficient. On top of that, rapid acceleration from a standstill makes for a “wow” factor. Whether two, three, or four wheels, this system is available for all classes of light electric vehicles. As it is made up of off-the-shelf automotive components, manufacturers will have the benefit of production-tested parts and minimal development expense. This gives both established OEMs and new players in the market the opportunity to launch vehicles within 12 to 18 months. 48-volt battery: Along with a boost recuperation machine and a DC-DC converter, the 48-volt battery is the main component in the 48-volt system. This battery stores recovered braking energy, subsequently delivering it to the electric motor and supplying the vehicle’s electrical system. The battery’s low mounting height of just 90 millimeters means there are more placement options – it can go under a seat or the spare-wheel well, for instance. Passive cooling allows for a compact design, helps optimize costs, and, as an additional convenience factor, makes the battery almost silent. 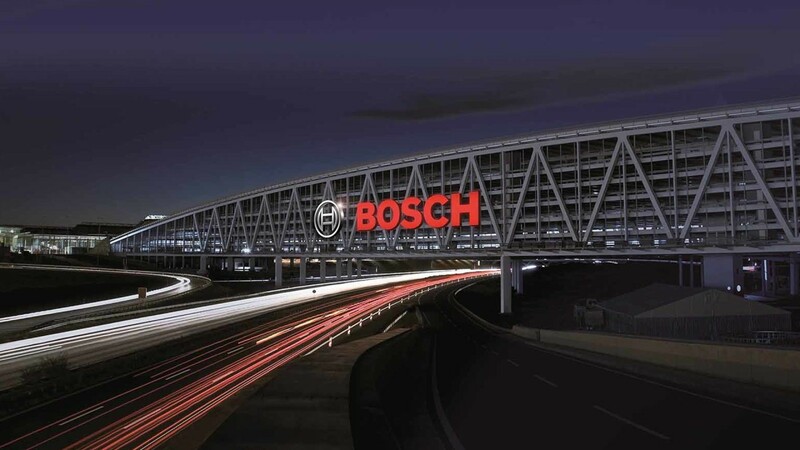 Bosch expects the strongest market growth to be in Europe and China. It has already procured a considerable number of production projects in China. The company’s main advantages over its Asian competitors are the calibration engineering it carries out on the spot and its considerable local manufacturing expertise. Port fuel direct injection: The best of both worlds. With port fuel direct injection, Bosch combines the benefits of gasoline direct injection with those of gasoline port injection. Gasoline port injection’s main strength is low friction losses during part-load operation, while gasoline direct injection exhibits a higher knock limit at nearly full load. Port fuel direct injection blends these two systems to exploit the strengths of each. In practice, the result is better fuel efficiency and lower particulate levels – during both part-load and full-load operation. Needle-closing control for diesel engines: The new needle-closing control (NCC) technology can precisely measure and control the duration of fuel injection in real driving conditions – accurate to just a few millionths of a second. To achieve this, a sensor is integrated into a solenoid-valve injector and paired with a cutting-edge, intelligent control software application. This establishes a feedback control loop that ensures significantly more precise injection throughout the injector’s service life. Complex injection configurations thus become possible, in turn helping to further reduce vehicle noise, fuel consumption, and emissions in real driving conditions. NCC also opens up new possibilities for online diagnosis of the injection system in the future. Vehicle control unit (VCU): Modern vehicles have as many as 100 standalone control units. A vehicle control unit, or VCU, can substantially reduce the number of such units. This frees up valuable installation space, reduces vehicle weight, and simplifies communication among control units. Acting as a central computer for the powertrain, the VCU in an electric vehicle coordinates powertrain components such as the inverter and transmission as well as systems that manage the battery and motor. A VCU can even handle specific functions if it is used as a domain computer. Functions might include operational and gear-shift strategies, torque coordination, high-voltage and 48-volt coordination, recharging control, diagnosis, monitoring, thermal management, and much more. Next MANN+HUMMEL will equip the vehicle with a newly developed brake dust particle filter. The robust housing of the filter fits closely to the brake caliper enabling the filter to capture brake dust particles at the source before they escape into the environment. This is particularly important as the amount of fine dust caused by braking in city traffic is probably more than that caused by exhaust emissions. While today’s modern brake pads are chemically much more environmentally friendly than in the past, more than 90% of brake dust also consists of fine particles which can still have a negative effect on human health. The new brake dust particle filter can be applied on all types of vehicle disc braking systems for automotive or non-automotive applications, whether for electric vehicles, hybrids or conventional gasoline and diesel vehicles. KYB Europe has launched a new, modern, multi-lingual website. The new website is designed to make it easy for distributors, technicians and motorists to find any information they need quickly and easily. With much improved functionality, the website has a user friendly format, is fully optimised for mobile devices and is packed with information. Over recent years, KYB has focused on creating a range of support tools for technicians. These are now all accessible from a central support zone which includes access to 360 degree product images, an extensive library of fitting videos, part specific technical information and technical bulletins. Distributors still have access to the interactive catalogue powered by TecDoc. A safety page is written for the motorist, to explain the various suspension components and their vital role on the safety of the vehicle. KYB Europe Marketing Manager, Jordan Day, explains “I am excited that this new website will support our customers at all levels to access the wide range of tools we have developed to make their jobs easier, ultimately improving their efficiency”. Plans are already underway for future industry-leading support tools which will be added online in due course. KYB Corporation has announced that it has entered into a sponsorship agreement with FIA World Rallycross Championship Team EKS from June 2017. The Audi S1 EKS RX Quattro is using KYB’s electronic power steering (EPS) which is widely coveted in motorsports. The KYB logo is visible on both the EKS racecar and service truck. EKS is made up of Toomas “Topi” Heikkinen and EKS owner Mattias Ekstrom. Swedish driver Mattias Ekstrom won the championship in 2016. The two-time DTM champion grew up with rallycross and spent a large part of his youth in RX paddocks. The team EKS is a celebration of everything that Mattias loves about racing; the passion, enthusiasm and joy. He is currently 3rd in the championship, with 143 points. Finnish driver Topi started racing at the age of 8 and switched to rallycross in 2010, winning the Finnish Championship in his first season. He became Global Rallycross Champion and also a two times X Games gold medalist. In 2014, Topi finished runner-up in the World RX Drivers’ Championship. He is currently 11th in the championship with 58 points. EKS has been competing in the WRX since 2014. In the 2016 season, EKS won the Team Championship, raising hopes for the team’s future prospects. KYB has been providing the team with EPS since 2015 and continues to provide technical support alongside the new sponsorship agreement. Rallycross consists of 12 two day events across the world, on tracks that are a mix of rallying and circuit racing. Drivers are equipped with RX Supercars with over 600bhp and the ability to accelerate from 0-60mph in less than two seconds. In 2014, WRX attracted 11.4 million European viewers watching the dedicated coverage across all 12 rounds. Keep an eye on KYB’s social media pages for regular updates on the EKS team. Schwäbisch Hall, June 23rd 2017. According to a study by management consultant PricewaterhouseCoopers, every third European new car registration could be an electric car by 2030. Hybrid and electric cars require electrically powered compressors since, instead of a combustion engine, a battery provides their energy. Thermal management expert Behr Hella Service has therefore been offering compressors for hybrid and electric vehicles for more than six years. As of early July 2017, the company will expand its portfolio by aggregates from compressor specialist Sanden. The Japanese automotive supplier already developed the first electric compressor for electric vehicles in 1990. Today, it owns various e-compressor patents. Behr Hella Service exclusively sells Sanden e-compressors on the Independent European Aftermarket. “We’re glad to welcome with Sanden yet another automotive supplier championing our sales network, simultaneously enabling us to expand our PREMIUM LINE range for our customers”, says Jörg Laukenmann, Head of Marketing at Behr Hella Service. The company introduced a new product marking system in early 2017. The PREMIUM LINE identifies some 4500 products made by manufacturers with Original Equipment (OE) expertise. In addition to various articles produced by BEHR, AKG and Visteon, the latest Sanden compressor generation now also forms part of it. It comprises different vehicle models, among the Mercedes Benz B-Class or the Volvo V60 hybrid. Almost two-thirds of drivers would primarily use self-driving cars for long distances. Automated driving technology provides a greater incentive to buy a new car. Drivers would rather be more relaxed behind the wheel and spend their time talking to passengers. “Don’t tailgate.” “Don’t drive so fast.” Or: “You could have easily made that light.” Drivers often have to hear sentences like these from their passengers. But soon that could be a thing of the past. Automated driving turns drivers into passengers – and cars into drivers. In the future, cars will independently pilot themselves at the touch of a button whenever drivers want. In doing so, they will obey traffic laws and speed limits, which will make driving safer. Many respondents want a self-driving car to relieve them of their stressful driving duties. Drivers are particularly interested in handing control over to the car during parking or in traffic jams, according to a recent survey on behalf of Bosch in six countries (Brazil, China, Germany, France, Japan, and the U.S.). The majority of the drivers surveyed would use the time during which the car drives itself to look out the window, enjoy the scenery (63 percent), and talk to passengers (61 percent). In just a few years’ time, self-driving cars will be a normal sight on roads. Respondents’ main hope is that automated driving will mean more comfort and significantly less stress behind the wheel. The car of the future – which will completely relieve drivers of the need to steer, operate the gas pedal, and brake – is primarily seen as something useful for long distances (67 percent) and leisure travel (61 percent). The majority of those surveyed expect a significant increase in terms of convenience (68 percent) and safety (60 percent) in many everyday situations such as searching for parking in cities. The survey also reveals an interesting ranking of the most desirable automated driving functions: parking was named particularly frequently (65 percent), as were the automated search for parking in downtown areas (60 percent) and stress-free navigation of traffic jams (59 percent). Relax, sit back, look out the window, and enjoy the scenery: this is how the majority of drivers picture the alternative to constant concentration behind the wheel. Of those surveyed, 63 percent said they would like to relax while their car is in self-driving mode. Having more time for conversations and for passengers thanks to automated driving was equally important to respondents. The options offered by automated driving make cars more attractive for many consumers. More than half of the participants (54 percent) in Bosch’s user survey agreed with this statement. Especially for male respondents, new technologies are an important selling point, with 52 percent of the men surveyed saying that self-driving technology would increase their interest in buying a new vehicle. In principle, the younger the driver, the greater their interest in buying a car with automated driving functions. For the survey on automated driving, Bosch asked roughly 6,000 licensed drivers in six countries: Brazil, China, Germany, France, Japan, and the U.S. Per country, 1,000 people aged 16 and up took part in the survey. Participants were selected on the basis of criteria defined by Bosch and Lightspeed Research. MANN-FILTER has once again been voted the best brand. During the annual survey of readers of the “trans aktuell”, “lastauto omnibus” and “FERNFAHRER” journals, MANN-FILTER again achieved first place for the sixth consecutive time in the filter category in 2017. Ludwigsburg, June 22nd 2017 – Once again, MANN-FILTER has convinced: During the “Best Brands 2017” survey, more than 11 000 readers of the “trans aktuell”, “lastauto omnibus” and “FERNFAHRER” journals voted for their favorites from 27 categories such as transmission, tires or brakes. In the filter category, MANN-FILTER products received 49 percent of the votes. 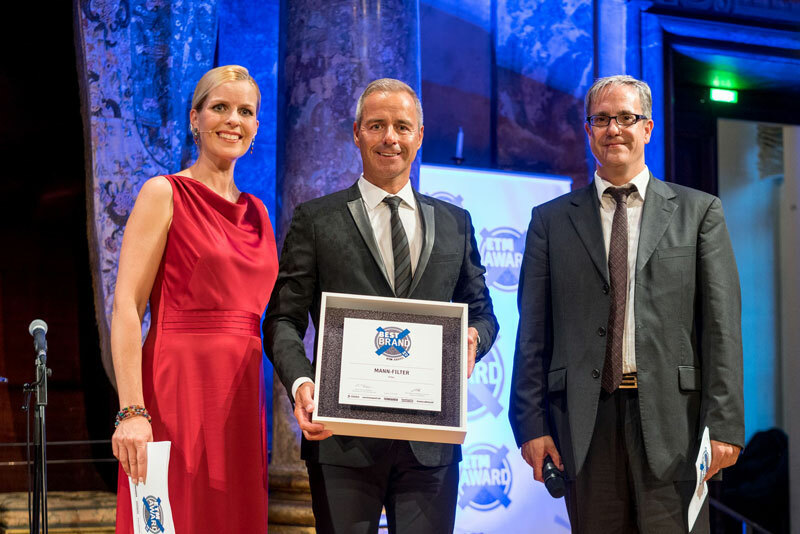 The vote for the “Best Brand” and for the “Best Commercial Vehicles” is organized by ETM-Verlag Stuttgart, a specialist publisher which issues all three magazines.